Disorders of the neuromuscular junction (NMJ) typically cause weakness. However, as a part of their full clinical presentation, patients with disorders of NMJ have a variety of sleep problems. Of them, Sleep-Related Breathing Disorders (SRBD) like sleep apnea and hypoventilation are the most common ones. Sometimes, the associated sleep disorder may be the presenting symptoms of the NMJ disorder. The associated sleep disorder can contribute to the fatigue that already exists due to the NMJ disorder. Identification of the associated sleep disorder and selection of appropriate treatment is critical to better patient outcomes. 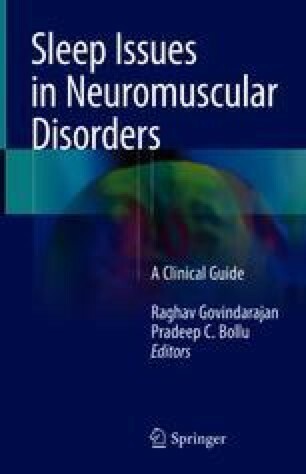 In this chapter, we go over the neuromuscular junction, the most common NMJ disorders, the associated sleep issues and discuss the therapeutic options.